This March 21, 2018, file photo shows Sen. Susan Collins in Washington, DC. Republican Sen. Susan Collins of Maine says she's "appalled" by President Donald Trump's tweet criticizing his Supreme Court nominee's accuser. 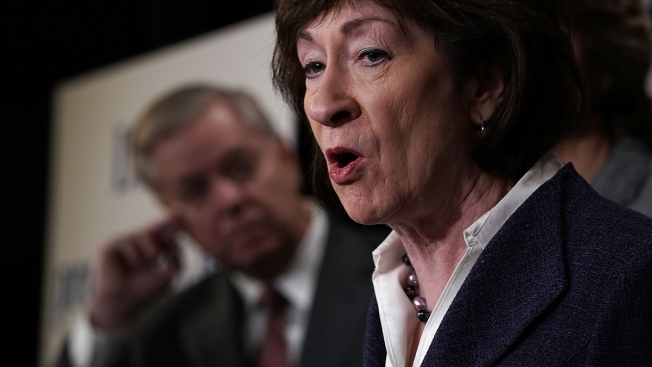 Collins also said Friday in Portland that it's reasonable for Brett Kavanaugh's confirmation vote to delayed to allow Christine Blasey Ford to testify Wednesday or Thursday. She also said it's important for the Judiciary Committee to "make it as comfortable as possible." Kavanaugh's nomination has been thrown into doubt by Ford's allegations that he sexually assaulted her when they were teens. He denies the allegations. On Friday, Trump tweeted that if the incident was a "bad" as Ford says, then she or her parents should've brought criminal charges.